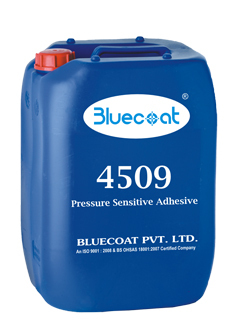 Bluecoat 4509 is a polyvinyl Acetate dispersion which is used as adhesive for stock papers. It is suitable for machine application processes, as well as for screen or brush application. For labeling on HDPE, LDPE, PET and PVC bottles. For manufacture of stock paper. For use in carpet backing. For preparation of coating composition for sound proofing. Bluecoat 4509 has a long shelf life exceeding 6 months to 12 months provided they are stored properly as mentioned above under storage. Bluecoat 4509 is available in 50 kgs.